“I would prefer that we don’t use, as retribution, canceling $110 billion worth of work, which means 600,000 jobs." President Trump is not very precise with numbers, but this is getting ridiculous. He keeps citing U.S. jobs supposedly at risk if arms sales are cut off with Saudi Arabia after the murder of journalist Jamal Khashoggi. Not only has the purported number of jobs from a highly tentative arms deal with the Saudis kept climbing day after day, but in the course of few minutes, Trump appeared to go from 600,000 jobs to 1 million. In his various statements, the president also claims that all of the arms-deal jobs being created would be in the United States, but that’s not true. Saudi officials have said that they will insist that 50 percent of the spending will be in Saudi Arabia, for Saudi jobs, if the tentative agreements are to go forward. According to a confidential 2017 document of all of the military sales agreements reviewed by The Fact Checker, most of the items on Trump’s $110 billion list did not have delivery dates or were scheduled for 2022 or beyond. There appeared to be few, if any, signed contracts. Rather, many of the announcements were MOIs — memorandums of intent. There were six specific items, adding up to $28 billion, but all had been previously notified to Congress by the Obama administration. Moreover, the Aerospace Industries Association says that in 2016, there were 355,500 manufacturing jobs supported by the entire defense and national security industry, generating $146 billion in annual exports. So it’s hard to imagine that $110 billion in deals with Saudi Arabia, spread over a decade, would significantly add to that total, let alone more than double it. For context, the U.S. economy is worth about $20 trillion a year. On March 20, when Trump greeted Saudi Crown Prince Mohammed bin Salman at the White House, he claimed 40,000 jobs were being created by about $19.4 billion in deals (most of which had been negotiated by President Barack Obama). The White House never provided an accounting of how the 40,000-jobs figure was determined, so we are dubious that it’s a reliable number. But even if we were to generously apply that same metric to $110 billion — one job for every $485,000 spent — you end up with only about 225,000 jobs. Note that Trump on March 20 mentioned THAAD — the Terminal High Altitude Area Defense anti-ballistic missile system. The Saudis let a September deadline for the deal with Lockheed Martin lapse, despite a 20 percent price cut given by Trump. So, for now, he cannot even count on the THAAD, which was one of the biggest elements of the $110 billion wish list. One of the few “done deals,” according to administration officials, is a $6 billion agreement to sell Lockheed Black Hawk helicopters. But the contract says the helicopters will be manufactured and assembled in Saudi Arabia. A Lockheed spokesman said the agreement would “support” 200 jobs at the company in Connecticut and 250 through “the supply chain” in North America, indicating that these are not new jobs in the United States. In other words, only half of the $110 billion, if the deals were actually inked, would be spent in the United States. Oh, one other thing: Trump keeps saying this is the biggest military sales order in U.S. history. Given that most of the agreements have not been completed and that it’s only a wish list at this point, he has no basis to make that claim. Obama offered Saudi Arabia $115 billion in deals, about half of which resulted in actual sales. We asked the White House for an explanation of the president’s remarks but did not get a response. The president is both exaggerating the number of jobs that would be created even if all of the $110 billion in purported sales were actually inked — and misleading about where they would be created. Many would end up in Saudi Arabia. Even if the figures did not increase by 50,000 from day to day, they simply are not credible. 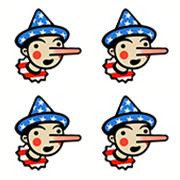 Trump earns Four Pinocchios. “I would prefer that we don’t use, as retribution, canceling $110 billion worth of work, which means 600,000 jobs.